Shortlisted for a 2018 Edward Stanford Travel Writing Award. Andina is the cuisine of the Andes of Peru. Welcome to one of the most contemporary yet ancient cuisines in the world. 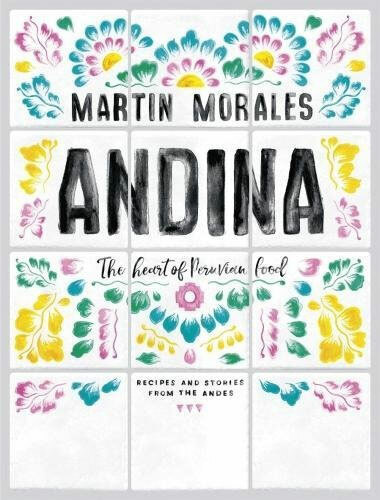 Featuring over 110 delicious and unfussy recipes accompanied by fascinating stories, dazzling photography and beautiful paintings, Andina is the first ever book to capture the food and scenery of the Andes and the spirit of its people and traditions. Andina also signifies a dish, an ingredient or a lady from the Andes. Martin Morales's grandmother was an andina and here he pays homage to her and all the women chefs (picanteras) who have shaped this soulful and traditional cuisine, which is at the heart of Peruvian food.For the last 15 years, Martin has travelled throughout the Peruvian Andes to collect simple, traditional recipes, magical stories and culinary inspiration. With dishes dating back thousands of years, alongside new creations by Martin Morales and his team of chefs who run the award-winning Andina restaurants, Andina's recipes have big flavours, vibrant colour and are simple to cook at home. From light, raw dishes to hearty stews and soups; cheeky bites to exquisite roasts; and sweet, aromatic desserts to comforting hot drinks, Andina presents authentic, nutritious all-day and all-year-round food made with seasonal ingredients.